YouTube Music arrives on all Sonos speakers | What Hi-Fi? YouTube Music is now available to stream on all Sonos speakers, including the latest Sonos One and Beam. 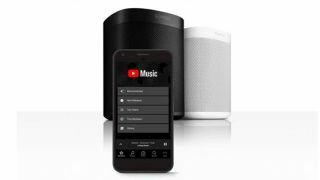 Today, the 2018-launched Google music streaming service has landed on the Sonos app, allowing Sonos speaker owners with a YouTube Music Premium or YouTube Premium subscription to directly access the streaming service catalogue from within it. YouTube Music Premium (£10/month) offers ad-free music streaming as well as downloads for offline listening, while the £12-per-month YouTube Premium (formerly YouTube Red) subscription offers ad-free, background and offline viewing across all of YouTube, in addition to all YouTube Originals. Naturally, owners of the smart Sonos One and Beam will be able to control playback of the YouTube streaming services through voice commands once Google Assistant arrives on the speakers, which should be very soon.